In 1899, Alfred Clark left Emile Berliner’s employment and went back to working for Thomas Edison’s rival business which sold cylinders rather than discs. Clark, you may remember had set up the world’s first record (disc) shop in Washington at the same time that Fred Gaisberg set up the first disc-recording studio in 1897. Fred and Alfred became firm friends during that time. Fred had moved to London to help grow The Gramophone Company in 1898, leaving Clark behind in Washington. The opportunity of working with Edison gave Clark a chance to follow Gaisberg across the Atlantic but rather than move to London, Alfred Clark took up residence in Paris at the very end of that city’s “naughty nineties”. It must have been a great posting. 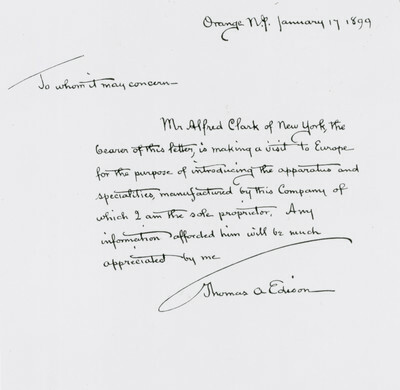 As you can see from this handwritten letter by Thomas Edison, Clark was Edison’s representative in the city and his role was to market the Edison cylinders and phonographs. He was also instructed to begin a programme of recordings to rival that being made by Fred Gaisberg. 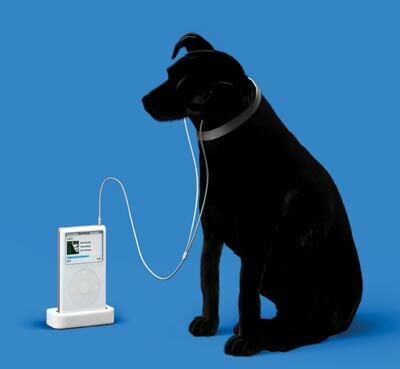 This would put Gaisberg and Clark head to head as they pursued new recordings for their rival companies. The handwritten letter was kindly shared with us by the EMI Archive Trust. If you’d like to know more about the Trust and the artefacts that they look after, why not get in touch with them, here. 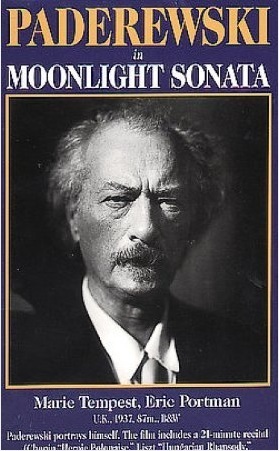 Photographs from long ago: #1 Paderewski. We have been given access to a number of vintage photo’s from the EMI Archive Trust which we’ll run as a series. 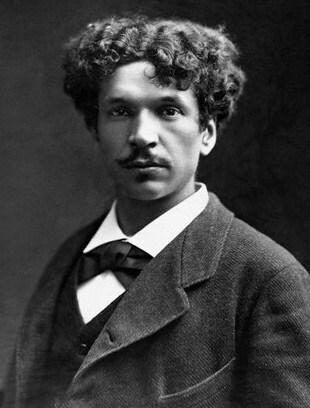 This is Ignacy Jan Paderewski. Quite a picture, quite a man…. Paderewski had a run of the mill career…..Born into a poor Polish family, he became a world famous pianist, married a Baroness, had a successful career composing a broad range of music including the only Polish composed opera at the New York Metropolitan Opera, bought a 2,000 acre farm in California and there made some of the earliest Californian wine, had a hit music hall song written about him (“When Paderewski plays” by “The Two Bobs” in 1916), formed the Polish Relief Fund to aid the Poles during WWI, gave a speech that inspired the Polish inhabitants of Poznań to begin a military uprising against Germany in 1918, became the second Prime Minister of Poland in 1919 and represented Poland at the Treaty of Versailles, became Polish Ambassador to League of Nations, was made an honorary Knight Grand Cross of the Order of the British Empire, retired from politics to sell out Madison Square Gardens on his return to the concert hall, became a film star (Moonlight Sonata in 1937), returned to public life to head the Polish Government in exile in London in 1940 and following his death in 1941 was awarded a star on the Hollywood Hall Of Fame. There are many streets and buildings named after him in Poland and the USA. 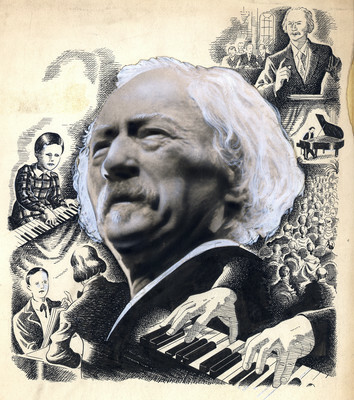 Paderewski…”was then at the zenith of his artistic career, with twenty brilliant, all-conquering years at the back of him. Was my awe and worship to be wondered at? Of all the musicians I have known he was the most inaccessible and in his presence one had always to be on one’s guard…A clumsy act and he could humiliate one in the most withering way. Thanks to the EMI Archive Trust for allowing us to publish the picture. You can learn more about the Trust and make contact with them to arrange a visit to their archive here. Gathering sounds out of the air. Charles Cros dawdles. Edison dawdles less. Paris was clearly the centre of the world in the early days of sound recording. 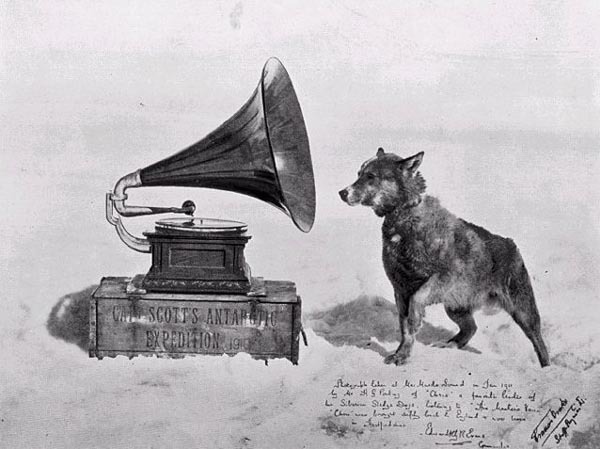 It was there that Leon Scott de Martinville invented his Phonautograph to capture sound onto paper in 1857 and 20 years later Charles Cros took the process forward by working out how to record sound onto a cylinder by tracing oscillations using a screw. In April 1877 he wrote a paper describing his thesis and submitted it in a sealed envelope to the Academy of Science in Paris. Before he got a chance to build a prototype, a hard working inventor by the name of Thomas Edison living thousands of miles away in the USA beat him to it. Edison had been independently considering the same problem and in late 1877 he built a machine that recorded and played back sound which he called a Phonograph. Edison became world famous whilst Charles Cros is largely forgotten. Cros died 11 years later at the age of 46. Bizarrely this was the second time that Cros had failed to gain recognition for a significant invention by being slow on the draw. In 1869 he had invented a way of taking colour photographs for the first time but took several months to submit his ideas to Société française de photographie. When he did get around to it, he discovered that a rival called Ducos de Hauron who had been developing his own method of taking colour photographs had submitted his own ideas that very day. And although De Hauron had discovered his method several months after Cros, the rival had built a device that could take colour snaps and produced examples whereas Cros’s ideas remained only theory. And like Edison in sound, De Hauron is now widely remembered as the inventor of colour photography…. Perhaps Cros was an ideas man who was less gifted at executing them or perhaps the reason that Cros never got round to building his imagined recording machine (which when he eventually did he would call the Paleophone) until some time later was that he was living a pretty full on rock and roll lifestyle. Paris was the cultural capital of the world in the 1860’s and 1870’s and Cros was a significant player in artistic circles. He was a poet who wrote strange and proto-surrealistic poems (his best known is The Kippered Herring), ran around town with Verlaine and Manet and even shared an apartment with Rimbaud for a while. Cros was fond of a good drink and Absinthe was his tipple of preference; a choice that may have contributed to his early death. He was a member of a group of artists who called themselves the Hydropathes and published a newspaper of that name. They were precursors to the Surrealists. 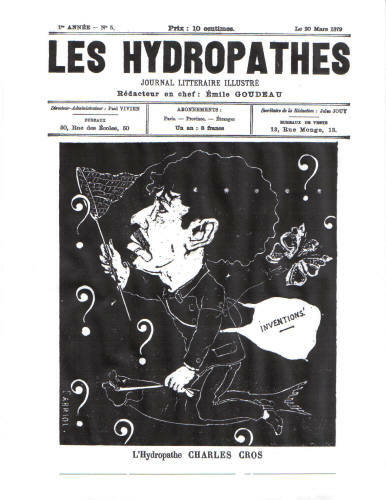 The newspaper featured an illustration of Cros on one of their covers in which (looking spookily like Bob Dylan) he rides a fish (presumably a herring) carrying a bag of inventions over his shoulder as he hunts ideas with a butterfly. Seems to sum the man up! Cros also had some crazy ideas about interplanetary communication which you can read about in this interesting blog article .